This post is part of the preschool series. Preschool math really is all fun and games. 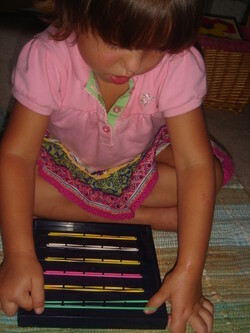 Learning to count, learning one to one correspondence, even beginning addition and subtraction never need be tedious. And at this stage of the game, math really can be manipulated all the time. Starting at the bottom of the shelf, a collection of Montessori geometric solids can be presented using the Three Period Lesson. 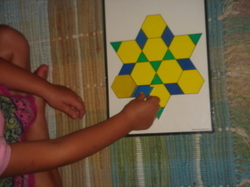 After it's been presented, the child can choose that particular work on her own any time. Learning the names and properties of solids is simple and sensorial. Next up is the hundred board. This is used by placing numbered tiles on the appropriate squares. Later, skip counting can be represented here as well. Katie can’t really do it alone, but Nicholas and/or Stephen are generally eager to help her. I got mine at a certified Montessori school. It’s a little worn and they were required to replace it with a pristine one in order to be re-certified. It was free! If you want to acquire Montessori materials for you home, it’s worth cultivating a relationship with a school directress. One of [Georges Cuisenaire's] inventions was a set of coloured wooden rods and some similarly coloured cardboard materials. He used these to teach arithmetic and found he achieved something rare with this subject. The standard of the results he obtained greatly improved and his pupils enjoyed and understood the work they did. Nevertheless this invention remained almost unknown outside the village of Thuin for about 23 years until a providential meeting of this teacher with another resulted in the use of this invention spreading to classrooms throughout the world. 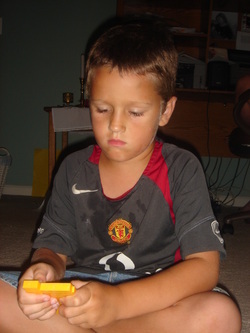 And in the 13 years since that meeting the proven success of Cuisenaire’s rods has made his name a household word. Dr. Caleb Gattegno met Cuisenaire during 1953 It seemed, he wrote some years later as if all his previous work as an educationalist had been in preparation for that moment. For many years he had been a leading figure in the movement to bring improvements to mathematics teaching at the primary and secondary school levels. 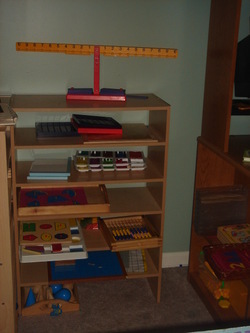 His firm belief that special teaching technniques coupled with the development of a hitherto unexploited intellectual ability in young children could produce such improvements, had already been demonstrated with encouraging results where his influence had been felt, In Cuisenaire’s rods he saw what many had already seen but found at once what few had been sufficiently prepared to understand Physically the rods behaved in the way numbers behave, providing the learners wnth an algebraic model for the study of mathematics. But perhaps more important still, he realised that they provided teachers with a means for making the lesson a personal investigation of mathematics for every pupil. And so it is—personal guided discovery of all sorts of mathematics principles using colored wooden rods. The rods are stored on the shelves in sorting trays and I provide rod racks there as well. I present a lesson or two a week and then encourage them to practice the work daily. We start with The Cuisenaire Rod Alphabet Book. From there, favorite resources for lessons include The Cuisenaire K-2 Super Source Book and Idea Book for Cuisenaire Rods. 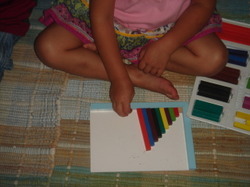 Eventually, this “play” leads to the use of Addition and Subraction with Cuisenaire Rods and Mathematics Made Meaningful. Cuiseanire really has an entire curriculum of its own, or we might switch to Miquon, combined with Touchmath. It really depends on how a particular child "sees" math. On days when I don't present a Cuisenaire rods lesson, we might spend some time together Exploring with Color Tiles or creating with Pattern Blocks. Both of these activities are almost guaranteed to draw an older sibling. Early geometry is tons of fun. 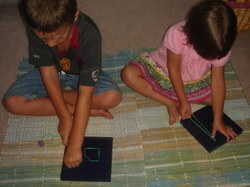 My children can be happily involved with geoboards for long stretches of quiet concentration. I don't often do formal "lessons" here, but encourage lots of creative exploration. And they pair up: one child can create an orginal design and another can try to copy it. The balance is a wonderful tool to use for several years. It's amazing what you can learn using this: time, money, measurement, addition, subtraction, Roman numerals, even fractions and decimals! Very cool "toy!" Base Ten Blocks can be used with base ten lesson plans and they can also as a suitable substitute for Montessori Golden Bead material. We have a set that snaps together. One final thought before we leave mathematics and move to religion: I don't really know where "preschool" math ends and school math begins. My children naturally move from counting to adding, from asking the time to telling the time. The "curriculum" above, with a very few modifications, serves us well into the primary grades.